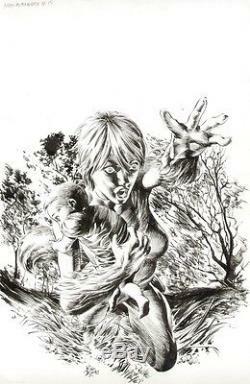 Original pencilled and inked cover art by Mike Deodato Jr. Published as the cover to New Avengers issue #15. Art is standard size Marvel art, approximately 11" x 17". A stunning piece of art, Squirrel Girl is set to star in the upcoming New Warriors tv series, so get this now before she explodes in popularity. The item "Squirrel Girl Mike Deodato original comic book Cover art New Avengers" is in sale since Wednesday, June 07, 2017. This item is in the category "Collectibles\Comics\Original Comic Art\Covers". The seller is "howardtheduck78" and is located in Jacksonville, Arkansas. This item can be shipped to United States.